SuperSystem 4th edition updates the world’s most comprehensive and versatile super skirmish game with a fresh new look that includes expanded attributes, new and revised powers, improved mechanics that speed play and allow for easier character design, and a new solo-play option! 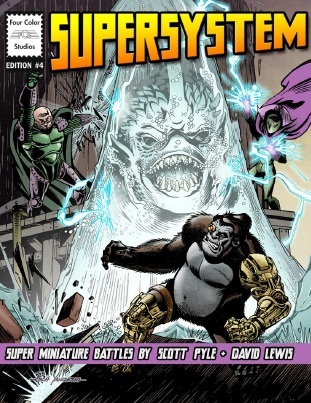 Built to work with SuperFigs or any other brand of Super miniatures (in 28mm or 15mm scale), SuperSystem provides a flexible setting and campaign rules that will allow players to further develop stories and characters with each scenario played. Joel Joel 10 10 10 Simply put, the best, most comic book "accurate" set of fast play rules in existence. the switch from the older 2nd/3rd ed model to the new 7 stat 4th ed model was a GREAT improvement. You can emulate and game with ANY superhero from any universe!! Jose Alvarez 10 10 10 Very fun version of the rules. The changes made from the 3rd edition are an improvement to the system. The system is easy to understand and teach. I use rebased heroclix miniatures with this game.